It’s 2025, the long troubled financial markets have finally crashed the overleveraged banking system and the world is experiencing global depression on a massive scale. 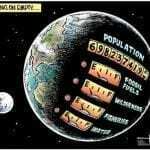 Precipitated by environmental destruction, heatwaves are scorching the planet, destroying the monoculture food crops, and there are food riots in every major city. In order to maintain the social order upon panicked and desperate populations governments are forced to introduce a command economy, issuing people supermarket food stamps. But for you and your family nothing has changed, you are awoken each morning by birdsong and the gentle rays of the sun. You light your wood-fired stove and boil the cast iron kettle, as it boils you prepare a breakfast from your orchard’s fruit and listen to news that seems remote and alien. Your biggest problems are what to do with all the surplus food and what to make for the dinner you are preparing for your friends and neighbors. Is it possible that this complex society we have come to take for granted is, like so many before, coming to its natural end? What can we all do to prepare for this dystopian vision of the future? The answer comes from David Holmgren and Su Dennet. They are living the sustainable life outlined in the latter part of the scenario and nothing much would change for them if we experience the now almost inevitable “big crunch”. Let’s learn from them and see how to create an enduring and self-reliant life. Don’t have time to read the whole post now, you can download the PDF here. 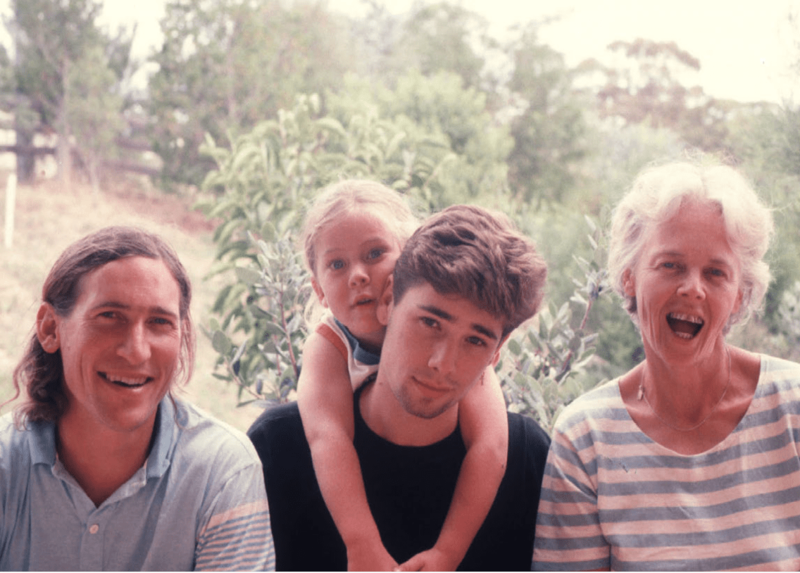 Family photo 1991; David, Kimon (19), Oliver (5) and Su. In 1985 David and his wife Su purchased a one hectare block of land on the edge of Hepburn, central Victoria, to build a family home and develop a self-reliant lifestyle which reflected their values. When they originally purchased the land it was covered in brambles and rabbit burrows, hiding the rubbish and degradation of the earlier decades. In the 25-odd years since, David and Su have transformed their block into garden of eden with more than 120 fruit and nut trees, a productive vegetable patch, and free-range goats and chickens. The property provides plenty of food, firewood, water and energy. The vast percentage (80%) of their food is provided from the property, and they make use of fermentation and preserving techniques to enjoy a largely vegetarian diet occasionally supplemented with locally hunted wild game. Today this is one of the best documented and widely known permaculture demonstration sites on the planet. Sometimes, they open ‘Melliodora’ to the public for personally guided tours. It’s well worth of a visit and I would heartily recommend it. Melliodora is a model permaculture property, showcasing how much of our needs can be catered for through good design and careful land use, particularly on smaller and urban properties. David is fond of stating the importance of models others can replicate and modify. So, let’s see what we can learn from this pioneering couple. 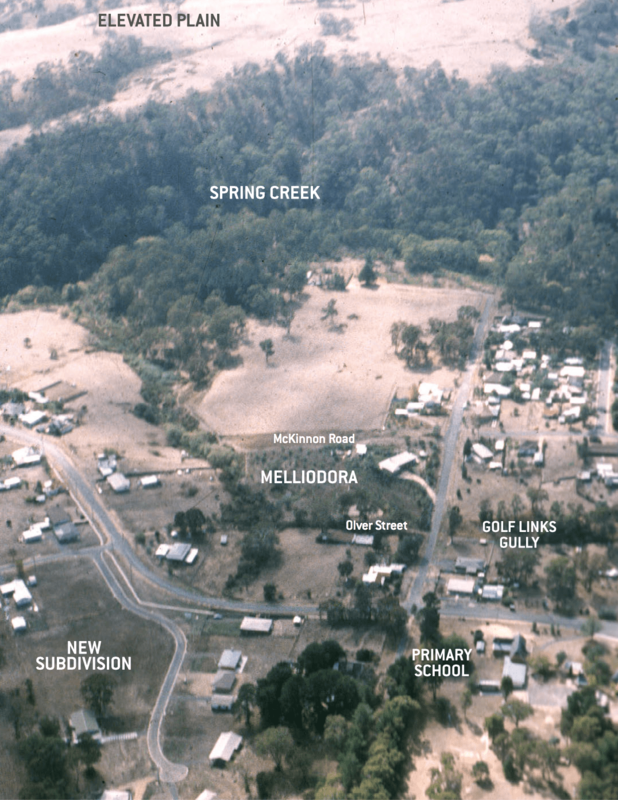 Aerial view of locality autumn 1989, showing Melliodora at the centre. Melliodora is an hour’s drive north west of Melbourne. It is in rural surroundings, in the midst of a small, convenient, rural township. This said, it still far enough from Melbourne that the influence of metropolis is largely unnoticeable.This said, it still far enough from Melbourne that the influence of metropolis is largely unnoticeable. When choosing where to live they had to consider where the customers for David’s consulting microbuses would be. Central Victoria and small rural town Hepburn Springs were considered to be ideal: relatively close to his target market, yet still with a likeminded community. Some might say that two acres is small, but those two acres is a lot for one or two people to intensively manage and, according to David, even that is a stretch. 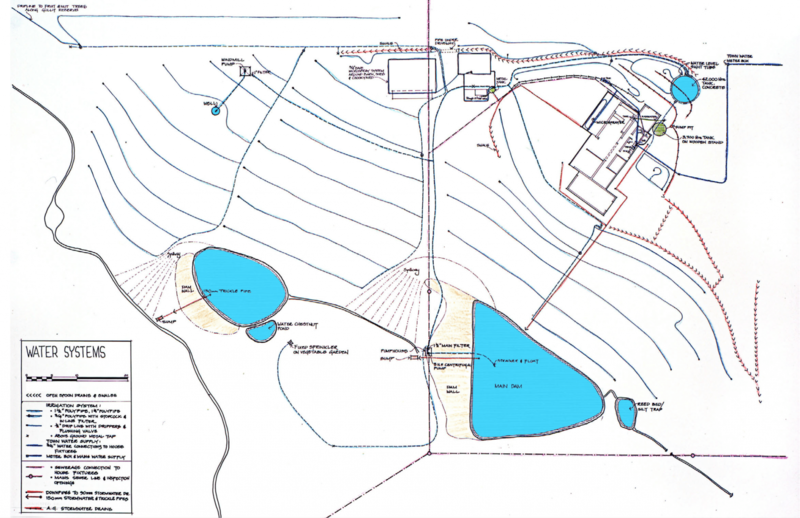 This acreage is also more than adequate to provide enough produce for the needs of a family. 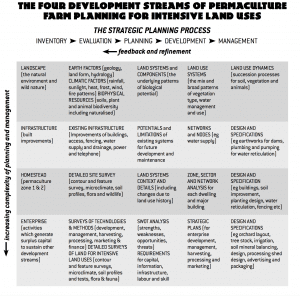 The strategic planning process for the farm. 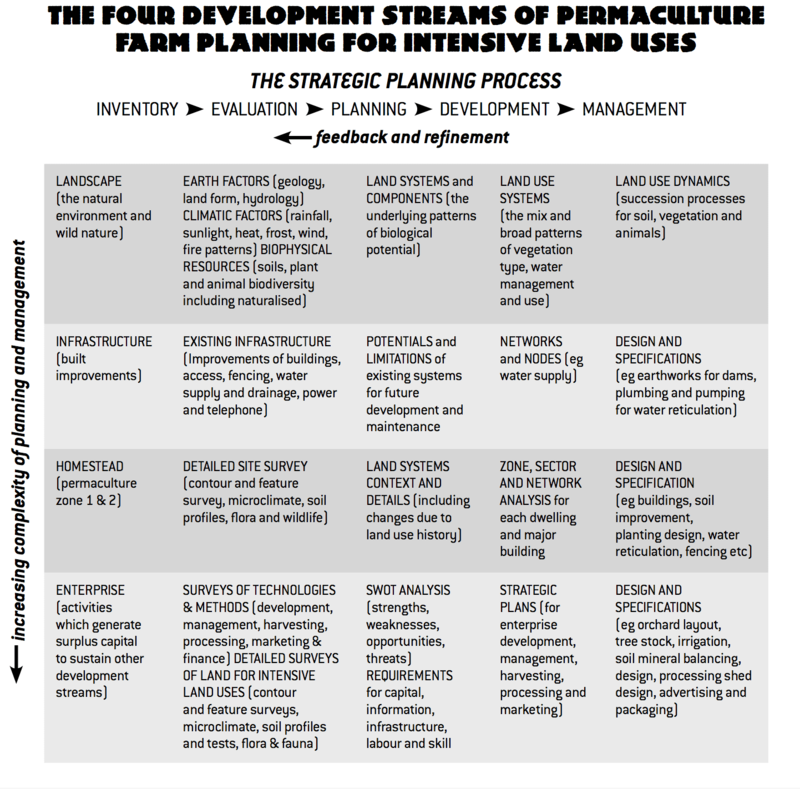 In a nutshell, landscape is the natural foundation and ultimate resource of any farm. It is the true source of its wealth and all other built “improvements” – infrastructure are added to landscape to enable the better use of this resource. 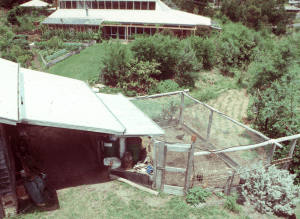 The homestead (zone 1&2) provides for household needs and also acts as a testing ground for new ideas, processes and species before they can be scaled to more broadacre use or for commercial purposes. The enterprise is the connection to the wider society and economy and the financial engine of the farm. These days, making a living from a farm involves more than just husbandry, hard work and management, marketing and finance are significant aspects that can’t be ignored. Customers and partners have become critical players in making a farm economically viable. Although land used to be much cheaper, and could therefore be purchased without a mortgage, this doesn’t change the fact that the approach to land development has always been critical for the successful establishment of the farm. With the help of a few friends David and Su built their house from scratch using mud bricks sourced from Bendigo, wood from local traditional sawmills, salvaged bushfire-burned cypress and blackwood. The house has a classic “passive solar” construction, with a greenhouse and full glazing along the north side. The thermal mass of the mud brick walls keeps the interior at a comfortable temperature. Food is stored in a “cool cupboard” instead of a refrigerator. Solar energy and firewood provide the majority of the home’s energy needs. Additionally, they burn about 5 to 7 tons of wood annually, which covers all the cooking, hot water, heating and food preservation. Being an owner builder has many advantages, it allows for customisation, the use of natural building materials, passive solar design to water harvesting and reuse systems, and, most importantly, lower costs. Moreover, you can build in stages as money become available, the famous pay-as-you-go strategy. Moving into the house before it is fully finished also allows for further refinement of design details. Australia is the driest inhabited continent in the world, this calls for proper water strategy planning. To David: “Failure to manage water resources to optimise the biological productivity of the land is a fundamental cause of land degradation.” On small rural properties such as Melliodora, water supply typically involves more design and capital input than for any other aspect except that of the house. Water supply is secured with 2 dams, a 42,000 litre concrete header tank, and a 3600 litre tank, which collects runoff from a small section of the house roof. 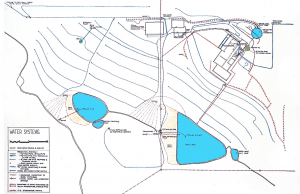 There is also town water supply, and an interconnected network of roof runoff and drainage systems. The total catchment for the dams is 40 hectares, the partially urbanised nature of the catchment resulting in the total water yield being higher than could otherwise be expected. The dam water is then pumped to header tanks at the top of the property to irrigate the gardens and orchard as well as reserve water for firefighting purposes. The entire water system is designed to offer a high level of self-reliance and redundancy, where priority is given to gravity fed systems. Irrigation tasks can thus be performed in a number of ways. Although there is a connection to the town water supply, it acts as a backup to the main water system. Zone 1 with chooks, raised beds and perennials. Although 2 acres appears modest, Melliodora nonetheless has 120 fruit and nut trees in a European style mixed orchard, along with chooks, geese, goats, and an intensive vegetable garden. The orchards yield 2t of produce which, in combination with the house gardens, provides for their mostly vegetarian diet, and creates a seasonal surplus – mostly consumed in residential courses or traded with local community. Although ‘zone 1’ house gardens and greenhouse offer important yields, it is the perennial plants that provide structure, functions and the main yields of the system. The mixed orchard is planted with fruit and nut trees on the contour and is intercropped with tagasaste (tree lucerne), a small evergreen tree that offers nitrogen fixing capabilities, provides good quality fodder, mulch and firewood. Food producing species include apples, pears, peaches, plums, olives, figs, feijoa, walnuts, almonds and hazelnuts. Animals are an integral part of this mature system. They provide additional yields such as milk and eggs, perform essential functions of vegetation control, nutrient recycling, and pest control, along with mechanical tasks such as shredding and ploughing. 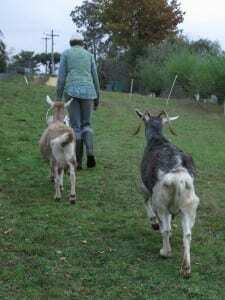 Chickens and geese are integrated into the orchard and goats are confined with electric fencing. Su with her goats, source of the milk for the family. The couple have downsized their lifestyle and, according to Su, decided “what is enough for them”. It’s worth mentioning that they haven’t been in a supermarket for 5 years and don’t have any products in the house. Their lifestyle was punctuated by Su milking the goats in the morning and evening, though David’s routine was less structured. Nonetheless, most days involved a combination of physical work in the garden and intellectual work in the office. David firmly believes that “A normal existence is place-based,” and he sees huge advantages to this way of life. It’s way more economical and you can live at a much lower cost. You are your own boss and not subject to the interminable regulations and demarcation control. In essence, you set up your own rules. 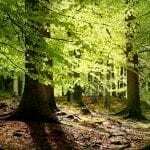 Another benefit of this form of home-based lifestyle, he believes, is the reduced environmental impact through no longer having to commute, and growing or making your own food. David and his son Oliver processing a pig. In pre-industrial society the non-monetary economies of the household and community were the bulk of the economy. Anything produced in the household was consumed by the household or gifted/bartered with neighbours thus cutting out intermediaries, or the government demanding tax. These days, in contrast, we are totally dependent on the goods and services that a monetary economy provides, and our jobs serve as a means for paying for them. David and his family understand the importance of the household economy: that family and the household is the core economic unit. This economy is based on multiple family members running numerous enterprises for their mutual benefit. For example, Su preserves food and also sells food in bulk to the local community, Oliver, their son, is a tech support guy and also hunts game, and David writes and gives lectures. Together they form a core economic unit whereby everybody contributes to the household. Their skills are directly exchangeable, both within the community and outside the centralised structure of the current monetary economy. David emphasises the development of these skills and recommends “Be jack of all trades but master of one”. Have a diverse skillset but master something you can exchange for other things. It’s the development of these skills that will prove advantageous as energy descent envelops us. Modern people have lost vital skills, and with them went the ability to be independent from the system. The more skills you have the more autonomy you can achieve, and anyway, it’s more rewarding than being dependent on others. 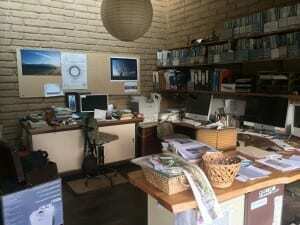 The office – economic engine of the farm. The Holmgren’s household has very low expenses. They produce 85% of their food needs, the utility costs are low, they live a frugal and home-based lifestyle and the whole family mutually contributes to the household. This way of life has ensured that they don’t have to generate a large income to keep the household going. 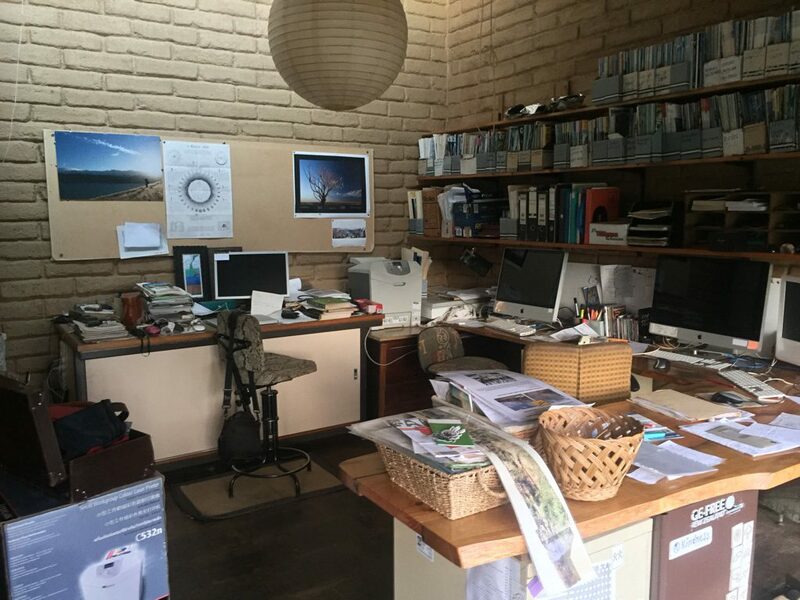 Their income is 100% permaculture-related in regard to their businesses Holmgren Design and Melliodora Publishing, their connection to the outside world and an economic engine of the farm. 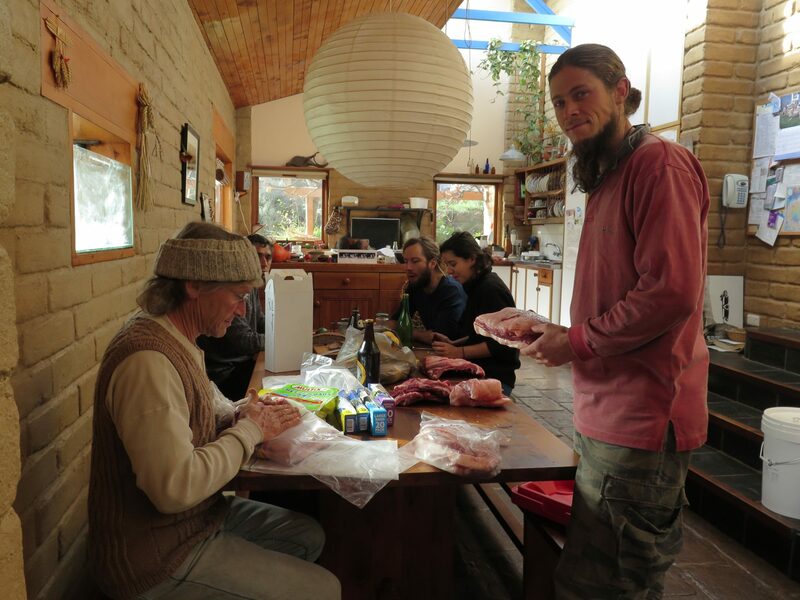 Their Mellidora permaculture gardens produce surplus food which is sold to the local community or used as a form of currency, feeding both the WWOOF-ers and the people on the courses. Publishing business – Melliodora Publishing; selling books, DVDs and other educational material. Consultancy and courses – Holmgren Design is a well-known consulting micro business, and has been running since the early days. David is an in-demand teacher, with people coming to his residential courses, as well as teaching in Melbourne and South Australia. Tours – Around 10 times a year they open ‘Melliodora’ to the public for personally guided tours. 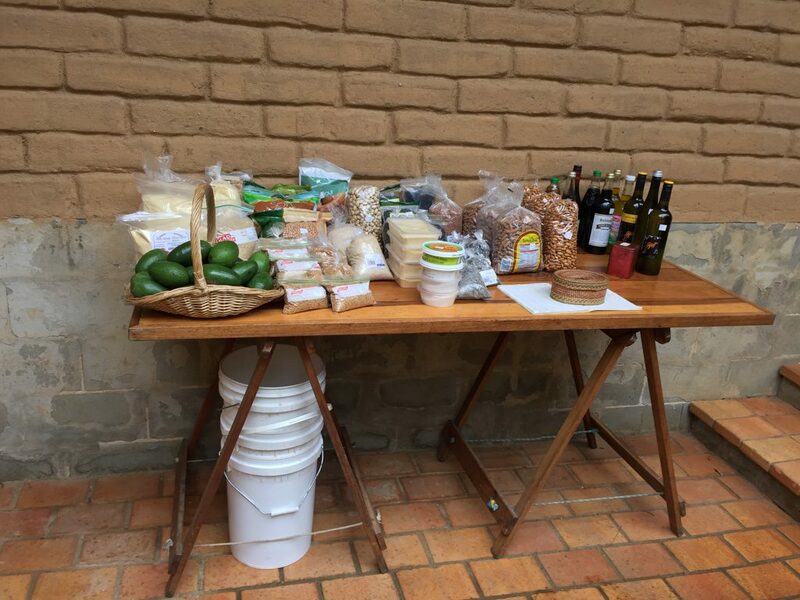 Selling surplus food from the Melliodora Permaculture Gardens. It’s not surprising that the main source of income comes from creating intellectual value. David is, after all, the co-originator of permaculture, and his contribution to the movement is significant. What we can learn from this model is that internet has provided us with a platform for communicating with the world and, although the Holmgren’s have a home-based lifestyle, the value they create in the international permaculture community is, nonetheless, financially remunerated. The internet and computing have allowed for the development of location-independent international business. Selling food to the community. Let me ask you something: When was the last time your neighbour came to your place for a pleasant chat? Do you even know your neighbour? You know, we have become so individualistic in nature that we no longer even show an interest in people who we may see every day. This has led to an atmosphere of suspicion, where the default position regarding those around us is one of distrust. David and Su were different from the outset, As David would write in his eBook, “Commitment to our local community has paralleled our increasing self-reliance and wider role in permaculture education.” They have been local environmental activists, promoting permaculture values and integrating them in subtle ways, knowing that this is one of the most effective means of social change. They are educating people with community movie nights, workshops and other events in the local town hall, schools or pubs. All of which providing value for local community and educate them about alternatives ways of doing things. 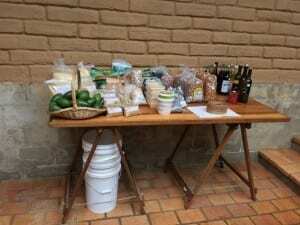 Another worthwhile endeavor is supporting and operating a local food co-op. Su buys organic food in bulk and resells to the local customers. The truly great thing is that she even doesn’t make any profit from it, but rather forges connections and creates value in people’s lives. Other growers use their property to sell their own produce too. What is important here is that these interdependencies bring local people together to appreciate the relationships they have with each other, making the Holmgren’s invaluable members of the community – and ones who provide essential services. For the Holmgren’s the principles of self-reliance and personal responsibility have been central to everything they have accomplished. They are owner builders, grow the food they consume, their son was home-born and schooled. In essence, they took full responsibility for their needs. 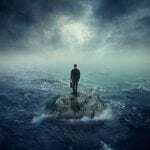 In a world where we have the imminent peaking of global oil supply, encroaching climatic catastrophe and the ongoing financial crisis, Holmgren’s model offers insight in how to build a sustainable alternative way before we are forced to be “living with less”, an eventuality David feels is inevitable. Even if you plan to be working on a bigger scale you can still adopt this model and adapt what you find applicable to your situation. I think they’ve taught us an important lesson in making a living by practicing permaculture! Let me know what you think about the Holmgren’s in the comments.